This efficient, economical unit is designed for table top use as a single unit or can be placed side-by-side. Efficient, economical unit is designed for table top use as a single unit or can be placed side-by-side. 3/4″ novaply, white high-pressure plastic laminate on exposed surfaces sealed to prevent shedding of particulates and contamination adherence. Also available in 16ga. cold rolled steel, painted white or stainless steel. 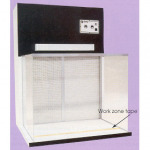 1/4″ clear acrylic side panels and canopy on all units. Features » 1" thick Dust Guard prefilter, 30% efficient NBS. 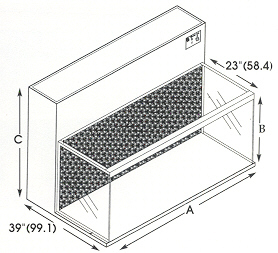 » Removable HEPA type final filter, 99.99% efficient 0.3 microns and larger. » Less than 100 particles per cubic foot 0.3 microns and larger. » Meets or exceeds Federal Standard 209 and ISO 14644-1. » High capacity forward curved blowers with direct drive blowers motor(s). » Statically and dynamically balanced, designed to maintain constant air flow without speed controls or belt adjustment to twice the clean filter resistance. » 115v, 1 phase 60Hz. » One outlet above canopy, 6ft cord, 3-prong plug. » Noise level conforms to OSHA standards or better.